Tomorrow is World IPv6 Launch Day and in anticipation of that event ISPreview.co.uk has managed to secure a short interview with Pascal Portelli, a Senior Vice President of global media and technology firm Technicolor, which is perhaps best known for building one of the world’s first truly consumer affordable and IPv6 capable broadband ISP routers (TG582n). Technicolor isn’t exactly a household name in the broadband router market, unless you remember Thomson, but over the past few years they have made significant strides forward. Becoming one of the first to do consumer affordable IPv6 (sold alongside AAISP’s broadband packages) is sure to help their prospects and also makes them an ideal candidate for our interview. 1. Current estimates predict that the Regional Internet Registry (RIR) for the UK and Europe (RIPE NCC) will exhaust its last remaining supply of IPv4 internet addresses during 2012. In your opinion, what will this mean for UK based broadband providers; especially those that fail to adapt? Some ISPs are proactively positioning themselves as IPv6 ready, making it one of their key selling points, or simply by fear of not being able to increase their subscriber base through lack of available IP addresses. The situation is less acute in more mature markets like Western Europe, where some ISP’s have retained IPv4 address space and have deferred the issue and some others who are adapting their networks to maximize IPv4 use. However, those who don’t adapt quickly are more likely to encounter future difficulties once IPv6 client devices and applications become more prevalent. 2. 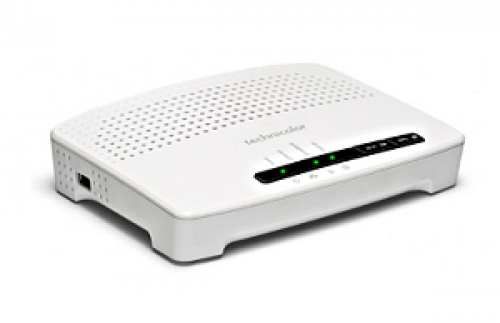 Technicolor recently made news after it became one of the first in the industry to ship a consumer affordable / sub-£40 wireless broadband router (MediaAccess TG582n) with real IPv6 support. Crucially one of the reasons that internet providers (ISP) often give for not supporting IPv6 is because they cannot get the needed hardware at an economically viable level. In your view, why has it taken router manufacturers so long to bring consumer affordable IPv6 products like the TG582n to market; especially given how old the standard is? One of the reasons that internet providers (ISP) often give for not supporting IPv6 is because of the need to upgrade their entire infrastructure to support it. This creates pressure on the overall IPv6 business case. However from a home platform standpoint, now that the standard is well established, it is possible to bring consumer affordable IPv6 products like our MediaAccess platform to market. This helps bring new services to market, and provides the certainty of a future-proof approach. 3. Did you face any challenges along the way to implementing IPv6 in your platforms? IPv6 has been added generically for all our platforms. Functionality has been progressively developed over a number of years. The main challenge is to keep simultaneously IPv4 and IPv6 stacks. It would have been easier to go natively to IPv6, but unfortunately we cannot change what end users have at home, so we need to keep assuming that there will be IPv4 devices for many years. 4. A mass of major global organizations, websites and businesses have all agreed to enable IPv6 addressing as standard on their servers from the 6th June 2012 (aka – World IPv6 Launch Day). Does Technicolor have any plans to celebrate or get involved with this event? We’re offering our customers the IPv6 capable consumer equipments; for sure a lot of them will be used during the World IPv6 Launch. Technicolor is actively engaged with IPv6 World congress and often participating in related discussions on the topic within the “IETF v6ops” working group. 5. Technology is evolving very rapidly. Aside from IPv6, what do you foresee as being the next major developments in home gateway router design and development? In access technology, VDSL, Fibre and LTE will supplement ADSL/ADSL2+. There are also interesting developments in home distribution such as G.hn, 802.11ac and 5GHz radio optimized for HD video delivery. However we believe that the way devices connect to the internet is equally important and one of the next challenges is providing seamless connectivity to devices other than PCs, from home automation and control devices to Wi-Fi-enabled tablets and smart phones. The latter is particularly important, as mobile operators struggle to cope with all the traffic in their mobile networks, and there is a growing interest in all sorts of hotspots solutions. Technicolor pioneered this technology with the launch of BT’s Openzone/FON several years ago, but we are now working on the latest generation called Wi-Fi Passpoint that will enable not only authentication without needing to type user name and password, but also automatic account provisioning and connection directly to the mobile network using Wi-Fi and a home router, all done transparently for the end user. Unfortunately we should point out that Technicolor chose not to answer several of our key questions, such as their position on the availability of router source code and most crucially their opinion on what “IPv6 Support” should signify; a somewhat important question. In any case we’d like to thank Pascal Portelli, whose full title is the Senior Vice President of Solutions Strategy and Portfolio Management at Technicolor’s Connected Home Division (quite the mouthful), for being kind enough to respond on the other issues. Please pop back tomorrow for a more extensive look at IPv6, what it will mean for you (the end user) and to learn which of the country’s primary broadband ISPs will be supporting it. Technicolor = rebranded Thomson = still low-rent junk whatever the name. Yeah i was gonna say the “Technicolor isn’t exactly a household name” bit confused me also, like you i also thought they were just an offshoot/rebrand of Thomson or going further back Speedtouch. Oh and yeah agree 100%. Cheap junk with rubbish GUI that offers little control and what control there is its messy and slow. Unfortunately this box of landfill poop is no doubt what ISPs will all start to bundle. Is the interface on this new box like many of their others and as slow as stirring treacle? I have one of these with O2, seems to function as expected and provides an improvement in stability over the previous O2 routers. Kudos in regards to ipv6 support out of the box along with a usb port for file sharing via stick. Also comes with support for several 3g dongle’s, route backup anyone? Feel the geek bursting out? why not try the embedded linux command line? Great little box with many features, well done technicolour. All I want to know is how I can retrieve the Technicolor login sreen: where I have yet to enter the password: is it possible that the Technicolor router, that sets its self up, has no need of the entry of the password.